Researchers find that emotional cues affect dining enjoyment. 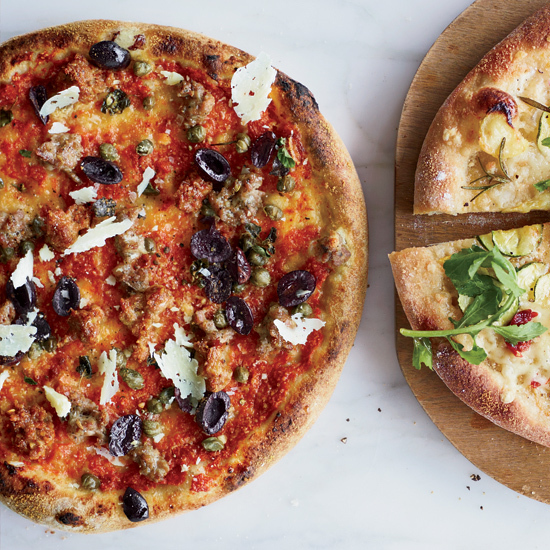 Italian scientists have figured out how to make pizza taste better—and it has nothing to do with cooking. Researchers at the University of Udine in Italy recently conducted an experiment with 18 male and 15 female volunteers aged between 20 and 31. The subjects were asked to rate the "desirability" of a margherita pizza based on its general appearance and then again after viewing facial expressions communicating happiness, neutrality, or anger. The first finding was no big surprise: Light red sauce, which can suggest an early state of decomposition, scored negatively. Bright red sauce is preferred. More important is the relationship between food satisfaction and social context: Seeing happy faces correlated with higher pizza scores. And, as you might expect, neutral and angry faces negatively affected food desirability. Our brains, it seems, use social context clues—happiness, sadness, anger—to help judge food even if the facial emotions conveyed have nothing to do with eating. As the abstract explains, "food perception can be affected by emotions, which are not necessarily related to food, but which nevertheless frame food delivery." People in the food-marketing and restaurant industries, take note. So the next time you want to impress someone with pizza, make sure you get a pie from a place that uses bright red sauce—and surround the pizza with as many happy faces as you can. This should not be hard to do.